While your home or business may be adequately illuminated, there is a chance that it is not lit in an optimal manner. The beauty your space relies on combining several different design elements to mesh together into one cohesive, beautiful outcome. Home lighting fixtures often revolve around overhead styles to provide the light you need to enjoy your house. While these are commonly used, wall sconces represent another viable option that may be the perfect solution to your outdoor and indoor lighting needs. Sconces and wall lights are versatile fixtures, providing ideal illumination for numerous applications. Utilizing these crafty options can improve your project and lead to a perfect outcome. Anyone searching for a lighting store in Omaha will be more-than pleased when they stop by The Light Palace. Our lighting showroom has provided the products and expertise that Nebraska homeowners have sought for more than 50 years, delivering quality with everything we do. No matter what your project is, our residential lighting experts are ready to offer the best solutions in the business. Today, we’ll preview the value of wall sconces by discussing different rooms in which they can optimize your space. When you’re ready to get started, be sure to stop by our store or shop our online catalog! 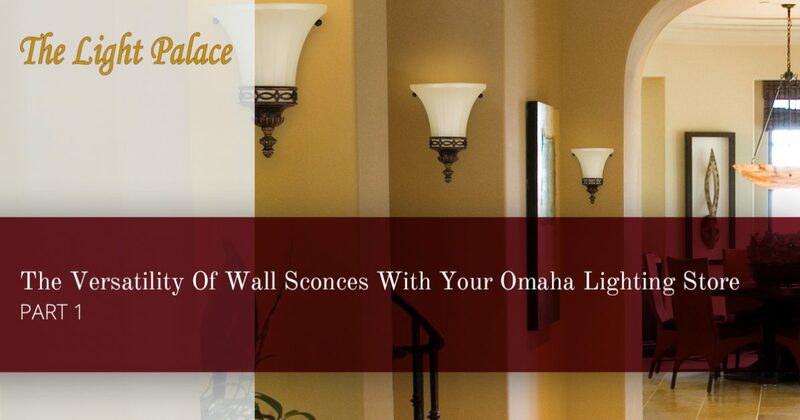 Wall sconces serve to provide a warm, comforting glow to each and every room in your home. These wall lights can also be utilized outdoors to great effect. With a wide variety of sizes and styles, our customers will be sure to find the perfect lighting fixture they need to optimize their home. You can benefit from placing sconces in a few of the rooms mentioned below. Your room can benefit from accent lighting in a variety of styles. If you are in possession of more up-to-date furniture, we recommend installing contemporary wall sconces to match the sleek styling of today’s home elements. Those that enjoy an old-school look can benefit from traditional styles, featuring various metal finishes and accents. Sconces are especially useful in bedrooms with low ceilings, as the illumination helps to light up a section of the ceiling, creating an airy feel that will help to open up the space. The compact nature and relative simplicity of these wall lights also ensures that you won’t be buried in work just to get them running! Sconces are an ideal way of illuminating your bathroom in a unique way. Vanity wall lights are available here, but bathroom lighting comes with a few considerations. For one, it’s important to not wash out your face in that mirror by adding too many elements or utilizing bulbs that are too bright. One common approach to bathroom lighting is to place a sconce on either side of your vanity, spacing them enough to create a balanced setup that serves as quality task lighting. Generally, sconces are placed in an alternating fashion, with a considerable distance in between each fixture to avoid overloading the brightness. Finding the right wall lights for your room can prove to be a valuable addition to any home renovation project. Next time, we’ll go into more rooms of the home that can benefit from the versatility of sconces, as well as tips for hanging them correctly. Anyone in need of help with their project can stop by our lighting store in Omaha for comprehensive assistance and inventory selections. Contact us today to learn more or stop by to browse our comprehensive lighting showroom!